Summer is ultimately more exciting with sand and sea and action-packed activities with this year's AXN Ultimate Thrill in Boracay. A destination for adventure seekers and beach bummers alike, this event will include challenging obstacles on land, air, and water for the teams. Participants would have to navigate their way from station 1 to 3 as they hope to finish the race ahead of all the others. Exciting challenges like water toss, giantjenga, robotic writer, and paddle bike are just some of the games that they would have to win during the first to third leg of the race. It gets more intense for the main finals as they would have to brave a wild ride on G-Max and glide through a zipline, but with an unexpected twist! Meanwhile, beachfront activities like body jam and hiit classes will surely entertain other beachgoers while the race is going on. AXN Ultimate Thrill 2016 will be held at Summer Place in Boracay on April 23, starting at 6AM. 200 qualified teams of 2 members, 18 years old and up, will have to register onsite. This onsite registration will be open at Summer Place a week prior to event day. 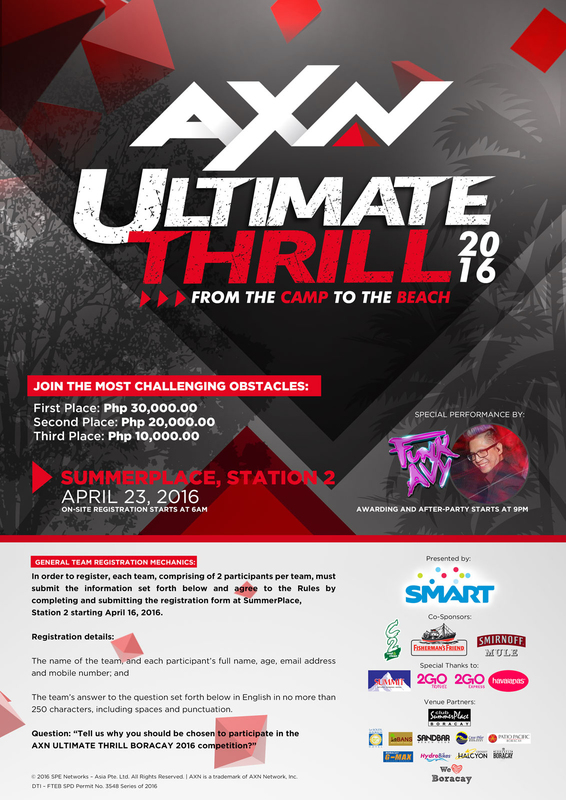 AXN Ultimate Thrill 2016 is co-presented by Smart and sponsored by C2 Cool & Clean, Fisherman’s Friend, and Smirnoff Mule. AXN is Asia’s leading general entertainment channel featuring exclusive top-rated drama series, blockbuster features, reality programs and ground-breaking original productions. The channel appeals to a discerning audience seeking content that is smart, intriguing and unexpected, and all delivered close to U.S telecasts. From The Blacklist and Quantico, to The Voice and The Amazing Race Asia, AXN is defined not by a genre, but by an attitude that truly redefines action. Launched first in Asia in 1997, AXN is a global channel brand with a presence in Latin America, Africa and Europe. In Asia, the channel is enjoyed in 85 million households across 20 territories.